We bring you a full line of natural and nontoxic cleaning choices that are Safe for You, Your Home, and Your Planet®called Get Clean®. · No harmful fumes or hazardous chemicals. · Outperforms 20 national leading brands. · Features Basic H2® Organic Super Cleaning Concentrate - just 1/4 tsp. makes 16oz. of all-purpose cleaner for only 3 cents. 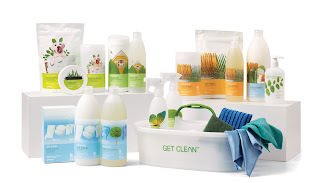 · And when you purchase the Get Clean Starter Kit you also make a positive impact on the planet and if you give one kit to a friend it is equivalent to planting 10 trees. · Keep 108 pounds of packaging waste from landfills. · Eliminate 248 pounds of greenhouse gas. Check out under my sink before I cleaned it out. There were all sorts of harmful chemicals lurking under there that included monoethanolamine (Used in oven cleaners), Ammonia,Lye and other harmful chemicals. I was shocked on all of the harmful products I was using. I am happy that I am able to try the Shaklee cleaners. Shaklee supplied me with all of the essential items to clean my entire house. Let me tell you about some of the products that I tried. I have tried many laundry detergents and some have not worked well in my HE machine. The Get Clean Laundry concentrate is very different. Its suds-controlling formula is kind on your washer. Its triple-concentrated formula saves money, water, energy, and space in your laundry room. Its fragrance-free formula is kind on your skin. Plus it’s a two-in-one cleaner: an incomparable pre-spotter and laundry cleaner. It made my dingy socks white and my colors brighter.It is so concentrated that I only had to use an 1/2 ounce for a full load of clothing. I am happy that I discovered the product and I plan to use it in the future. I have always pre-rinsed my dishes before placing them in the dishwasher because I found that the dishes came out cleaner. I decided to try the Shaklee dishwasher product with out pre-rinsing and the dishes came out clean and there were no spots seen. I had to use half the amount and it dissolved completely with no clumping and residue. AND IS SAVE FOR THE ENVIRONMENT AND YOUR FAMILY! And other great items including a Caddy. Thanks to the folks at Shaklee, (1) reader of Books R Us is going to receive a Get Clean Mini Kit. This kit retails for $46.95 and can be viewed here! Look under you kitchen sink and see if you find any of these ingredients in your products: kerosene, phenols, cresol, lye, hydrochloric acid, sulfuric acid, sulfuric acid, petroleum distillates, ammonia, sodium hydroxide, butyl cellosolve, phosphoric acid, formaldehyde, chlorine bleach, morpholine, and phthalates? 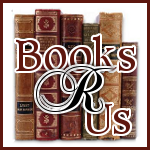 Please leave a comment on what you discovered and then enter via Rafflecopter. IF YOU HAVE DIFFICULTY LEAVING A COMMENT PLEASE REFRESH THE PAGE. I found ammonia on the first product I looked at. I FOUND SOME BLEACH UNDER ONE COUNTER AND AMMONIA UNDER A NOTHER,WHICH I THREW AWAY. I don't need to look because I know they are all there! LOL I hate throwing out almost full bottles of cleaners though! We have a few green cleaners but they are so much more expensive that's it's hard to switch over all at once! I found chlorine bleach in several products. Nope! LOL but I knew I would not find any of these things because I only use eco-friendly, non-toxic, green cleaners in my home.